Nozohaem. Stops nosebleeds in moments. Nosebleed — epistaxis — is one of the most common causes of bleeding. An estimated 5 –10% of the population will experience nosebleeds at least once a year. Nosebleeds are usually self-limiting and will generally stop in time, but they should be taken seriously and if you are worried you should consult your doctor. 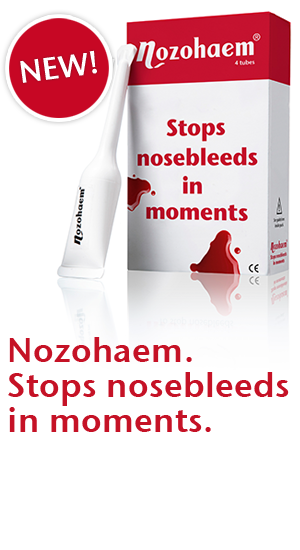 Nozohaem is a safe effective way of stopping the bleeding quickly, without mess and fuss. There can be many local causes including: nose-picking, foreign objects inside the nose, allergy, rhinitis and colds, chemical irritants, some topical medications, low humidity causing excessive dryness. Nosebleeds can also be associated, for example, with polyps, tumours or vascular malformations. If you are concerned in any way about the cause, consult your doctor. Some medication (anticoagulants, for example) can give rise to nosebleeds. There will usually be a warning to this effect on the packet. Is Nozohaem safe to use? Nozohaem is safe to use and can be used both for severe and for lighter bleeding. It works in a natural way, applying gentle pressure to the site of the bleeding. Urban myths about stopping nosebleeds range from dropping a cold key down the back to the use of brown paper. Before the introduction of Nozohaem the only sure, self-administered remedy was the use of tissues, handkerchiefs and a lot of patience.